- Put all ingredients into a blender, puree. - Puree garlic, onion, red pepper, salt, sugar, and ginger. - Saute until fragrant, put the meat, stir-fry until it changes color. - Enter the remaining spices. - Enter the coconut milk, cook over medium heat until cooked and tender meat. add water if sauce is too little. - Enter the potatoes and cook until the potatoes cooked. 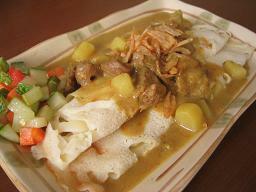 - Enter the solution of rice flour, cook until sauce thickens. - Mix all ingredients, mix well. put in plastic container, cover. - Store in the freezer for 3 hours.